It has been several months since I posted a food-related article, so I decided it was time to rectify that. This is in part because I have been much more conscience of my food choices of late. Not because I ate incredibly unhealthy, but I have introduced several more fruits and vegetables into my daily diet while eliminating things like soft drinks, all processed foods, and fast food. Additionally, I have limited red meat, alcohol, desserts, and baked goods made with AP flour. Speaking of food, if you live in Nashville as I do, one finds a wonderful oasis for Foodies. Most people think of Barbeque when they think of Tennessee, but Nashville more than holds its own in terms of culinary diversity and quality. One staple dish for this city is Hot Chicken. If you ever visit Nashville or live here and have not tried it, I cannot impress upon you enough the level of flavor Hot Chicken achieves. What is Hot Chicken? Essentially, it is spicy fried chicken, served over a piece of white bread, with pickles. If you like fried chicken and enjoy a little kick in your food, then it is the perfect dish. Combine that with the fact that this simple piece of white bread soaks up the juices and spices after cutting into the chicken, adding a whole other dimension of flavor. Mix the egg with roughly a tablespoon of water and whisk to combine. This creates an egg wash. Without detaching it, gently fold back the skin to reveal the meat. Apply a pinch of salt, preferably Kosher, and a generous amount of your spice rub. Replace the skin and dredge in the egg wash, making sure to let excess egg drip off. Lightly salt the skin, and then apply the spice rub liberally to the chicken. Dredge the chicken in the breadcrumbs, covering generously. Place in a baking dish or on a cooling rack over a sheet pan. Repeat for all pieces of chicken. Drizzle the pieces lightly with olive oil, cook in oven. For two thighs, cook roughly 50 minutes. Plate by placing one piece of bread per piece of chicken on the plate. 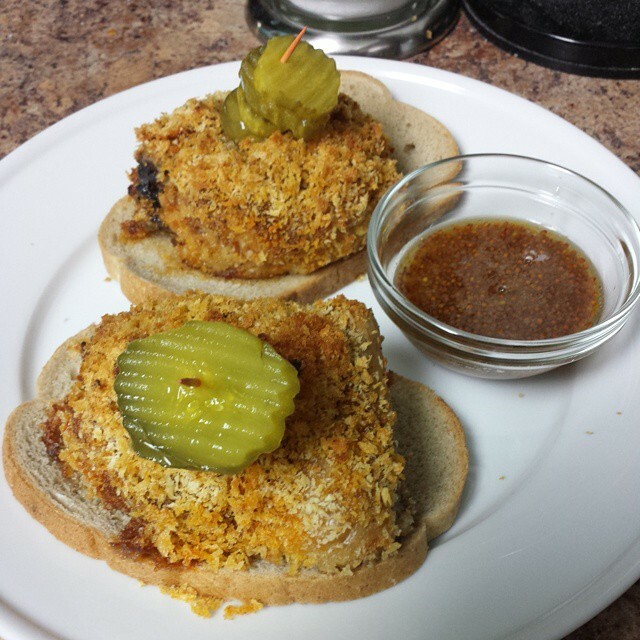 Place chicken on top of bread, then spear 4 or 5 pickle chips on top of chicken. You may ask why such a long time, for which I have two very good reasons. First, chicken , like many meats, cooked at a low temperature over a longer period of time will be more succulent and flavorful. Secondly, the low temperature will prevent the spices in the spice rub from burning, thus preserving their flavor and heat. Finally, I would recommend some component to balance the heat, such as a creamy dipping sauce or a cool Cole Slaw. In this photo, I have homemade honey mustard. Use Rye bread instead of standard white bread. Shoot me an e-mail or sound off below if you have tried Hot Chicken, have your own method for cooking, or have improved on mine. As always, thank you for reading. This entry was posted in Life and tagged Food, Foodies, Fried Chicken, Healthy, Healthy Eating, Homemade, Hot Chicken, Nashville, Recipe. Bookmark the permalink.